Cairns Esplanade, Marina, Butterfly Sanctuary, Sky rail cableway and the most important, Cairns City Centre boasting great nightlife, restaurants local events and entertainment! 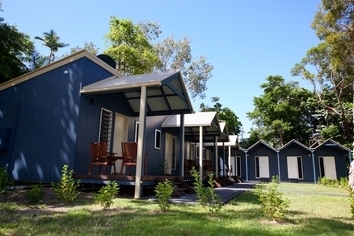 After a day of adventures, tours, travel and thrill seeking experiences, why not relax in our Brand New Backpacker Lodgings featuring a modern design, with air-conditioning and Austar or set up camp under a large shady site. All of our sites are drive-thru, making life much easier. 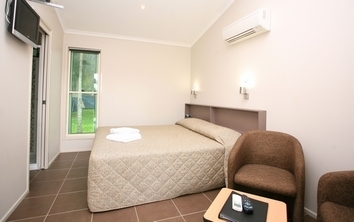 The park has been redeveloped in 2006 with state of the art facilities to cater for your holiday needs. These include a swimming pool, camp kitchen, fully refurbished amenities, reception, kiosk, tv room and baggage storage area and Free Wireless Internet just to name a few. 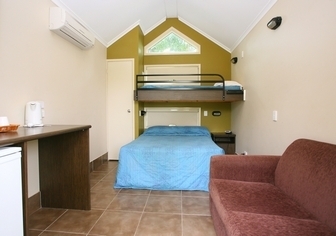 Perfect for your next holiday in Cairns!! 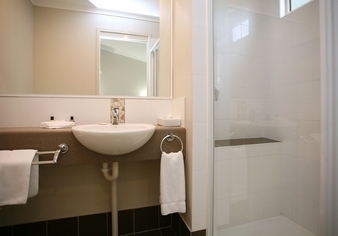 Brand new lodgings for 2 with private ensuite. North along Sheridan Street also known as Captain Cook Highway turn left into James Street and then left into Little Street. From the south north along Bruce Highway also known as Mulgrave Road turn left into Martyn Street, where KFC is situated. Turn right into Thomas Street and left into Little Street. From the north south along Captain Cook Highway past the Cairns Airport on the left approx 1 km turn right into James Street and left into Little Street. From the west east along the Kennedy Highway, turn right into Captain Cook Highway past the Cairns Airport approx 1km turn right into James Street then left into Little Street. Surely not to be missed, Cairns Holiday Park recommends you experience all of the following while in Cairns. Great Barrier Reef. If there's something you must do when staying in Cairns, it is to visit the Great Barrier Reef. Imagine beautiful reefs, exotic fish and marine life, clear warm water and the hot sun combined to make a glorious experience. There are plenty of things to do out on the reef these include scuba diving, snorkeling, deep sea diving, full day and half day trips, helicopter flights over the GBR or a private charter if you prefer. Cairns Esplanade and Lagoon. The Cairns Esplanade is peaceful and great spot for recreational activities for people from all walks of life. Enjoy an early morning jog, bbq dinner, watch the unique bird life feeding along the mudflats or simply relax on the grass amongst the tropical lifestyle. If you need to cool off, the Cairns Esplanade Lagoon is patrolled by lifesavers on a daily basis from 600am to 1000pm October to March and 700am to 900pm April to September. Night markets are not to be missed either on the Esplanade. Jumping and the only bungy operation on the planet that offers 16 different jump styles from traditional swan dives to riding off the roof on a BMX Bike. If bungys not for you, then the MinJin Swing will have you squealing from the top of your lungs!